Subaru goes a long ways to make a point. The Justy ECVT proved that an electronically controlled variable transmission could work, even if it did not raise the sales of the car. Another Subaru, the SVX, proved that one of the Italian designer Giorgio Giugiaro's latest concept cars could be mass-produced without sacrificing its distinctive character. The point of the $22,650 Legacy Touring Wagon is less esoteric. It proves that a performance-bred all-wheel-drive chassis and decent drivetrain can be mated to a traditional wagon body without comprising its function. The Touring Wagon shares its drivetrain with the Legacy Sport Sedan, a car that has racked up numerous rally wins and endurance records during its three-year life. These proven performance credentials, combined with the extra room, made the wagon a serious contender in this year's One Lap of America rally. Though it was piloted by three unshaven Canadians through four days of liquid skies, a Touring Wagon beat a Corvette, a pair of Nissan 300ZXs, and an expertly driven nissan pickup in its way to a tenth-place finish. Unless it has a Finnish owner, the average Touring Wagon won't see that kind of rally duty often. It's equally capable as a grocery go-getter, although its cargo area pales in comparison with the larger Taurus and Camry Wagons. With 36 cubic feet of cargo space, it's sized more like Honda's 35-cubic-foot Accord EX wagon. Despite its diminutive capacity, the cargo hold is well shaped and accessible, and I can be more than doubled by flipping the rear seats forward. Plus, the user-friendly tailgate easily clears six-footers and unlocks independently of the central locking system. The long list of standard equipment includes a permanent all-wheel-drive system, anti-lock brakes, a terrific Clarion 80-watt sounds system, and a brand-new electronic four speed automatic culled from the SVX. The transmission sometimes flutters between gears at half-throttle but otherwise provides smooth and decisive shifts. A shifer-mounted button locks out first gear for snowbound launches. The all-wheel-drive system works invisibly to provide an extra dose of control. Because it's linked electronically to the transmission and anti-lock sensors, it can divert power to the wheels having the most traction. In Michigan's worst snowstorm last winter, the Touring Wagon cruised over patches of packed snow and ice with confidence. Subaru's turbocharged aluminum flat-four engine hums with sewing-machine precision at idle. But when it rushes toward redline, an earthy note accompanies it. It twists out 181 pound-feet of torque and 160 horsepower smoothly and feels like a small-displacement V-6. 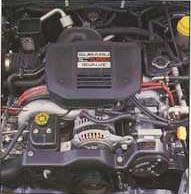 The only clue to the turbocharger's spooling action is a faint whistle and a strong surge beginning at 3000 rpm. The 3261-pound wagon can reach 60mph in 8.2 second, on the way to a top speed of 124. It uses plenty of fuel in driving so -- we averaged only 17mpg during mixed use. Both Moma and Hanma Mikkola will appreciate the Touring Wagon's responsive steering and braking. As in the SVX, the engine-speed-sensitive variable-assist steering is wonderfully precise: the wheels transmit nearly every pavement change without excessive filtering and without wresting control from the driver. The brakes can be easily modulated up to the brink of anti-lock intervention, and they haul the wagon down from 70mph in just 174 feet. The styling is conservative,, almost without character. 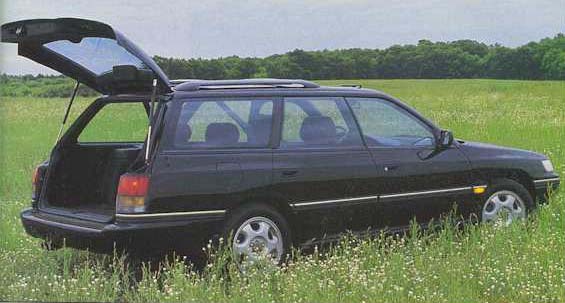 The Touring Wagon looks austere and clean, though not timeless, and does not use the ungainly C-pillar found in the sedan. Large panes of glass and understated details abound, and a new front-end treatment looks more substantial than the previous face. The cockpit carries the Germanic theme to its logical conclusion but hits a snag or two. Nearly every surface is gray vinyl or plastic, crafted from high-quality materials but executed dully. The seats can be adjusted to fit a wide variety of bodies, but they feel like they were upholstered by accountants. Drivers must endure a motorized shoulder belt even with the standard driver's air bag. For now, Subaru has a lock on this niche. No other company can answer the call for an inexpensive, all-wheel-drive performance wagon. If your daily grind includes the carpool, errands, and the Paris-Beijing rally, the Legacy Touring Wagon is the only entry on your must-drive list.